Eas Dun Lodge is a modern, family-run Bed & Breakfast, overlooking beautiful Lough Eske in County Donegal, Ireland. The bed & breakfast sits at the foothills of the Bluestack Mountains, in a peacefull country area, with spectacular views in all directions. All rooms are furnished to a very high standard and we are delighted to have been recently awarded 4 stars by the Irish Tourist Board. 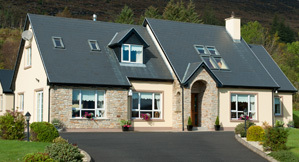 Eas Dun Lodge is circa 7km from Donegal Town and 2.5km from Solis Lough Eske Castle & Harveys Point Hotel. We look forward to welcoming you to our home! Guests at Eas Dun Lodge can enjoy easy access to some of the best hiking & walking trails in Donegal. Due to our unique location at the foothills of the Bluestack Mountain range, guests can literally follow the Bluestack Way trail from our doorstep. With a diverse mix of woodland, lakes, rivers, mountains and bogland, the Lough Eske & Bluestack region is a walkers dream. From quiet country strolls to challenging mountain hikes, the area has something to offer for everyone. 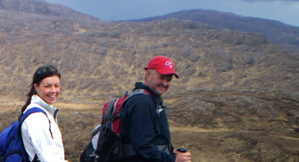 We are members of the Donegal Walkers Welcome, providing walkers with guided hikes, maps and advice on local trails. Below are just some of the comments from our guests on Trip Advisor. The owners are very warm and welcoming,the rooms and the place in general was absolutely spotless,really nice location,the only sound when we woke up was the singing of the birds. We arrived to the place after dark so when we looked up the window in the morning we were really impressed with the beautiful landscape and a great sunrise over the lake. 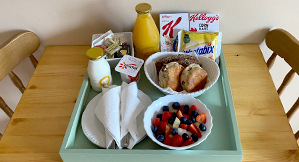 Breakfast was a meal itself with large selection of cereals,fruit yoghurt,fresh fruit salad and a really good cooked Irish breakfast. Well done to Ann,she's doing a great job!